Accounting students at Maharishi University of Management are getting a leg up on the competition. Those students have the opportunity to become certified in a worldwide accounting standard. According to M.U.M. accounting professor Andrew Bargerstock, the university is the first in the world to offer this certification as part of its curriculum. The standard is called Extensible Business Reporting Language, often referred to simply as XBRL. It is a way of creating an accounting document that allows the information to be easily transferred to government agencies such as the Federal Deposit Insurance Corporation or the Securities and Exchange Commission. The program requires a high level of computer coding knowledge. Bargerstock said learning how to use the program is no easy task because the students are bombarded with tons of technical computer jargon unfamiliar to most accountants. Bargerstock and 11 of his students have been certified in XBRL, so he knows just how difficult the program is to learn. “I failed the test the first time I took it, and had to go over it and over it again,” he said. Learning XBRL is no picnic but once the students complete the necessary training they will stand out from their peers. Recruiting firms have told Bargerstock XBRL certification will put M.U.M.’s students at the top of the pile of résumés when it comes time to look for a job. The federal government has required businesses and organizations to submit their accounting records in XBRL format since 2011. Bargerstock said the advantage of XBRL is the numbers only have to be entered in the original accounting document and not in every report created from that document. When it comes time to create the reports for the various government agencies, each agency extracts from the document whatever it needs to create its own report. In the past, accountants would have to tediously fill out reports for each government agency. Now, those reports are created automatically by the computer thanks to the way the information is coded. 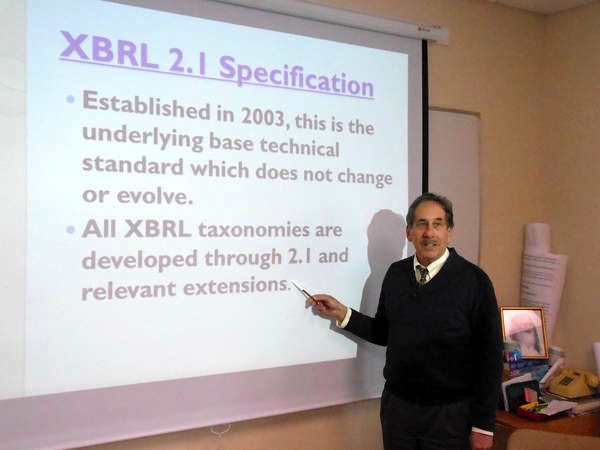 Bargerstock introduced his students to XBRL certification last fall. Although he helped the students with their certification, they trained for the certification on their own outside of class and did not receive academic credit. Another group of six students began taking a class with Bargerstock in November in which they were receiving academic credit while obtaining XBRL certification. Those students will finish their class in February. Reprinted with permission from The Fairfield Ledger. The article was on the front page of Thursday’s Ledger, five columns across the middle of the page, with a photo. Related: @LauraSimon reports on @MaharishiU Accounting students gaining certification in new worldwide financial reporting standard. This entry was posted on January 17, 2014 at 6:06 pm and is filed under Articles, Education, Maharishi University. You can follow any responses to this entry through the RSS 2.0 feed. You can leave a response, or trackback from your own site.